Microsoft unveils an update to its latest operating system, responding to underwhelming consumer response with a slew of changes designed to make Windows 8 more familiar. Microsoft unveiled an update to its latest operating system today, responding to underwhelming consumer response with a slew of changes designed to make Windows 8 more familiar. The company showed off a series of updates Thursday, aimed at making the system easier to navigate and letting users set up software so the computer starts off looking in a more recognizable format. Last fall, Microsoft unveiled Windows 8 to much fanfare, pitching the operating system as a revolution in personal computing. Clearly targeted at mobile and tablet devices, one of the key features of the system is a tiled-based mosaic display that essentially does away from the traditional desktop icon and Start menu layout that has been ubiquitous on all Windows machines since the mid-1990s. Microsoft hopes to quiet critics by allowing users to start the operating system in a desktop design with an omnipresent Windows logo anchored in the lower left corner of the display screen. Users will also be able to ensure their favourite applications, including Word and Excel, appear in a horizontal task bar next to the Windows logo. But instead of a Start menu, the new Windows 8.1 will lean heavily on Microsoft's Bing search engine to help users find whatever it is they're looking for on their computers. A built-in connection with Microsoft's online storage system, SkyDrive, to back up photos, music and program files. A lock-up screen that will display a slide show of a user's favourite pictures. Larger and smaller interactive tiles than Windows 8 has. In an effort to avoid any further confusion about the operating system, Windows 8.1 also will plant a tile clearly labelled "helps and tips" in the centre of the startup screen. The switch should ease the "cognitive dissonance" caused by Windows 8, said Antoine Leblond, who helps oversee the operating system's program management. Despite consumer complaints about the redesigned Windows, Microsoft says it has already shipped 100 million units since its launch last October. 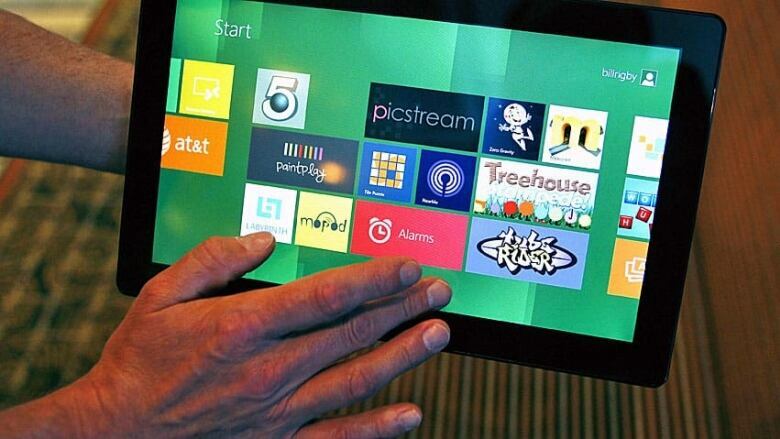 The free update, called Windows 8.1, will soon be available to any customers with a Windows 8 computer.